California Highways: Everything You Ever Wanted To Know About Numbered Highways. 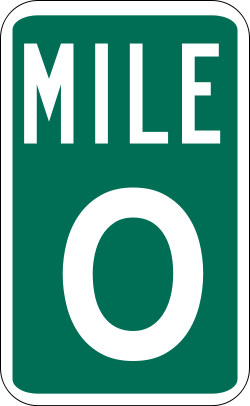 “Dumb as a post” Anyone who slings that insult around hasn’t had to georeference a common locality type in natural history collections, those based on road mileage, specifically referring to milepost on the highways and byways of the US. Recently the Georef Team had a few based on California county road mile markers: “near 14 mile marker, Carmel Valley Road, Carmel Valley” and “Mile Marker 19.5 on Carmel Valley Rd.” to list just two on the same road. When out in the field, especially finding a noteworthy roadkill or walking along the road looking for stream confluences, it is convenient to use the landscape and mile markers to record your locality (and the GPS is packed up! ), so these are far from rare in some collections. However, it’s a landmark that is not necessarily easy to georeference without a spatial database of mile markers. What? California does not have one! Hmmm, maybe they also include georeferencers, too. But lucky for us, roads are common reference points in museum collections, especially offsets from an intersection or mile markers. 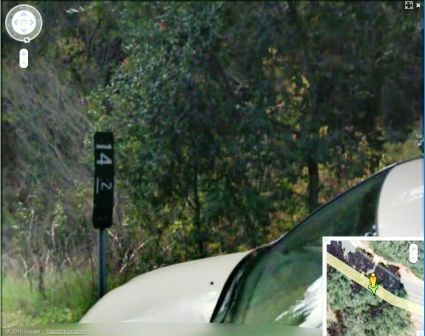 So using previous GPS coordinates for another locality as a reference point, undaunted georeferencer Joe was able to measure along Carmel Valley Road and find approximately where the said mile marker should be located. Then for added 21st century style virtual confirmation, used Google Map‘s StreetView to refine the location by spotting the exact postmile marker! On the downside to all this remote groundtruthing is that we no longer had a pressing excuse to take a long drive in bucolic Carmel Valley. This is also an example of why a pooled spatial database of museum collection localities would be so valuable since it was a previous georeferenced locality that let us measure along the road for a pretty good estimate of this specimen. Thanks, Jeni, for a gem of a site!